Adventure travelers tend to need backpacks that are durable and comfortable – two areas where the Lowe Alpine AirZone Pro excels. The AirZone Pro is a 4 season hiking pack, however in this review, I’m reviewing it from the perspective of a traveler, not a hiker. 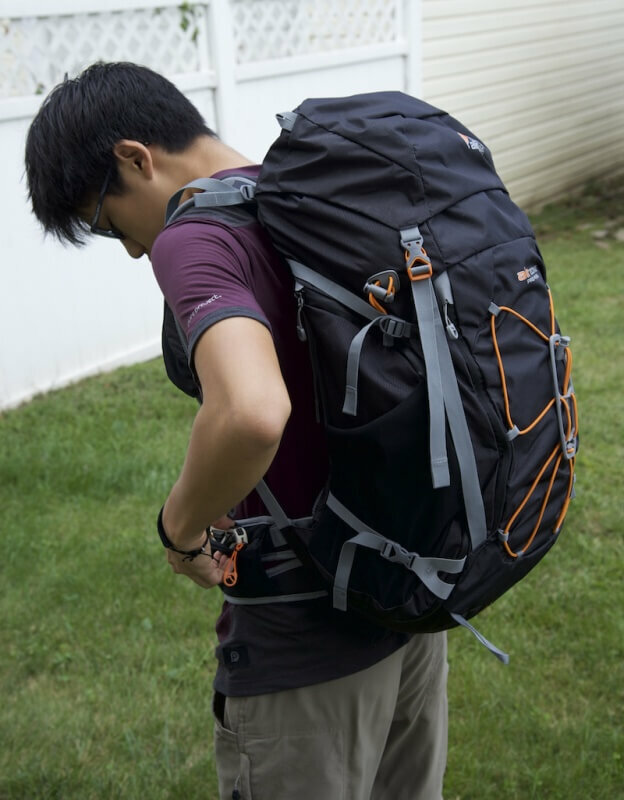 Lots of the features on this backpack meant for hiking are also useful for travelers, however some other minor aspects are not as ideal for travelers as they would be for hikers. While most travel backpacks are essentially suitcases without wheels, the AirZone Pro sheds the ugly boxy look for a streamlined hiker friendly shape. The numbers “45:55” in this backpack’s name refer to its capacity. It ranges between 45 to 55 liters (about 2750 to 3350 cubic inches), which is within my ideal travel backpack size. 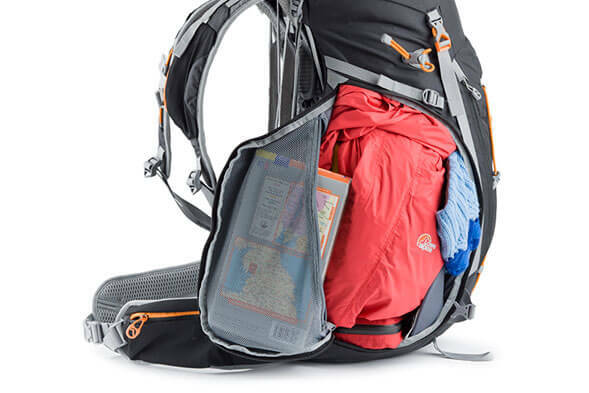 The Lowe Alpine backpack’s capacity ranges between 45 and 55 liters because of its extendable lid. There are two drawstring closures, either to be used depending on how much gear you’re traveling with. The capacity is perfect for long term traveling and overnight adventures. The extendable lid allows for more flexibility when traveling, and for you to have extra space for those souvenirs you plan to take home. As for whether you’d be able to take this backpack as a carry on, it would depend on how packed the bag is. If it’s closer to the 45 liter mark, it would probably meet requirements, but if you’re extending the lid, it would probably be too long to be used as a carry on. Accessible via the top opening, the main compartment of the Lowe Alpine AirZone Pro 45:55 backpack is where most of your gear will be. One of my favorite features of the Lowe Alpine backpack is its side zipper which allows you to access items on the bottom of the main compartment without having to dig through everything. Usually with top loading backpacks, if the you needed to get a shirt which was located at the very bottom of the pack, you would need to remove everything packed above that shirt in order to get the shirt. In addition to the main compartment, there are several pockets on the exterior of the pack. 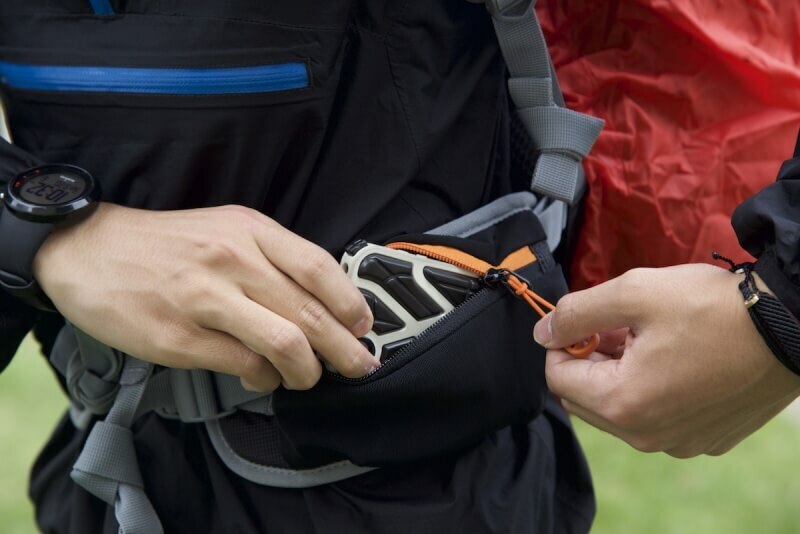 Located on the lid of the pack are two pockets for small items needed to be quickly accessed. The waist belt sports pockets which can be used for a phone, small camera, sunglasses, some snacks, money, tickets or documents. There are two large mesh pockets located at the sides of the pack, perfect for water bottles. 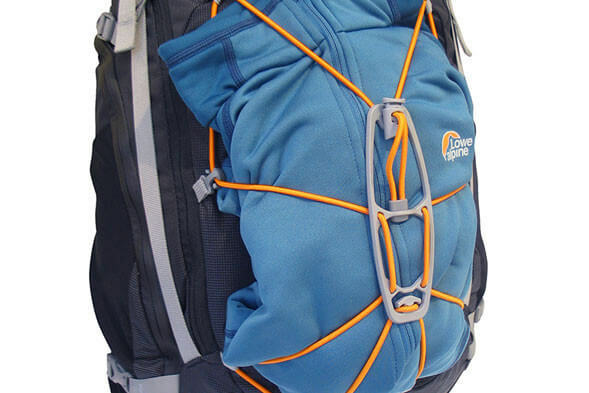 On the outside of the pack is a unique elastic system which is great for holding large bulky items, like your insulating layer, a sleeping mat or a even a rain jacket. Compared to travel backpacks, the Lowe Alpine AirZone Pro backpack is dream to carry. The backpack has an ergonomic and padded waist belt which transfers the load to the hips. Some travel backpacks don’t even have a waist belt at all. Even when compared to other hiking backpacks, the AirZone Pro is super comfortable, a lot of which is due to the good fit and AirZone technology. The backpack is highly adjustable and has straps to raise and lower the shoulder harness, tighten and loosen the shoulder straps and do whatever you need to get the right fit. The suspension system is designed to have minimal contact with your back allowing for lots of air circulation. The pack on its own can shed a bit of water, but if it starts to pour outside, you’ll be best off whipping out the photogenic red rain cover. When I first used the rain cover, I was pleasantly surprised at how easy it was to set up. When not in use, the rain cover is easily stowable in it’s dedicated pocket located at the bottom of the pack. While the top loading system of the AirZone Pro backpack is suitable for hikers, it isn’t the ideal setup for travelers. The side opening on the backpack helps to mitigate this issue, but it still isn’t as easy as a suitcase style opening. When all the compression straps are cinched down, you’ll be left with lots of dangling straps. To add to that, I’m quite skinny, so the waist belt and shoulder straps are tightened almost all the way, leaving even more loose straps. This can get annoying and the straps can possibly get caught on things. I’d recommend for travelers using the Lowe Alpine AirZone Pro to use packing cubes to help organize their clothes. I’ve written about packing cubes extensively and you can read more about them here. 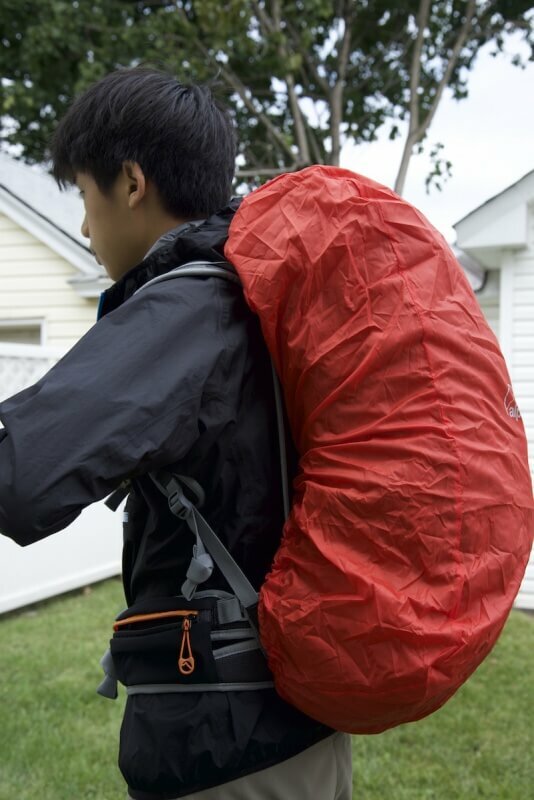 The AirZone Pro 45:55 backpack is almost shaped like a jelly bean. 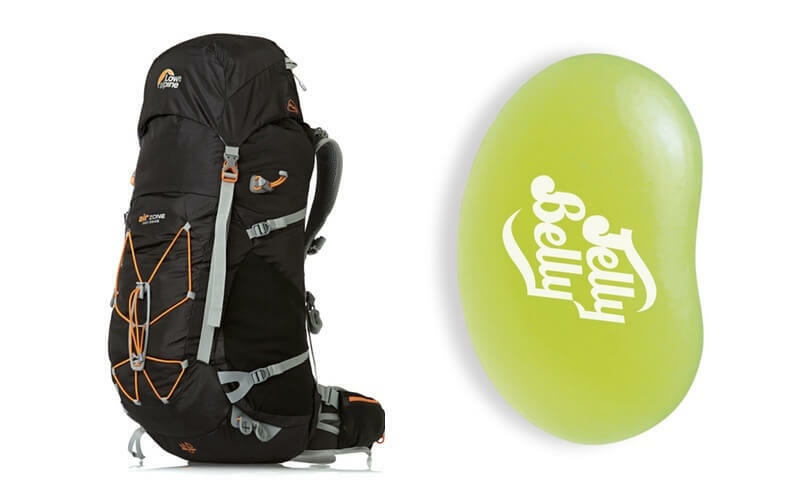 I don’t have a problem with jelly beans, but the reason I’m bringing this up is because the shape make it difficult to pack hard objects like a laptop into the backpack. The back curvature is due to the AirZone ventilation system which is great for keeping your back cool when hiking on hot days, but not so great for maximizing usable space. It’s certainly more ergonomic than other travel backpacks *cough* eBags Motherlode *cough*, but unfortunately the curvature makes it difficult to pack ridged things like laptops. One small issue that I’ve come across is that the quick access pocket on the right strap is a bit too small for most modern smartphones. I could still put a flashlight or a granola bar instead. The Lowe Alpine AirZone Pro 45:55 backpack is a hiking backpack that is suitable for adventure travelers and those needing a comfortable and durable backpack. 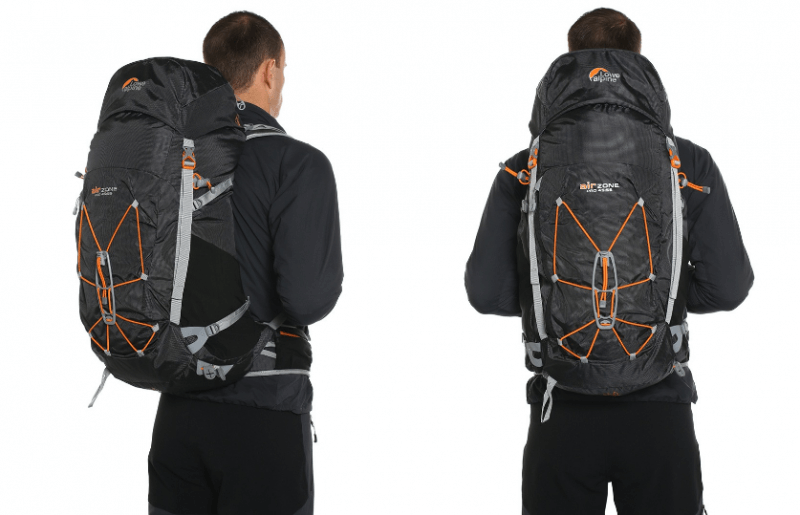 Its suspension system makes the pack comfortable to wear even with heavy loads and for long distances. The backpack is well thought out and designed, although it may not be well fitted to urban travelers. Have any questions about the Lowe Alpine backpack? Leave your comment below. 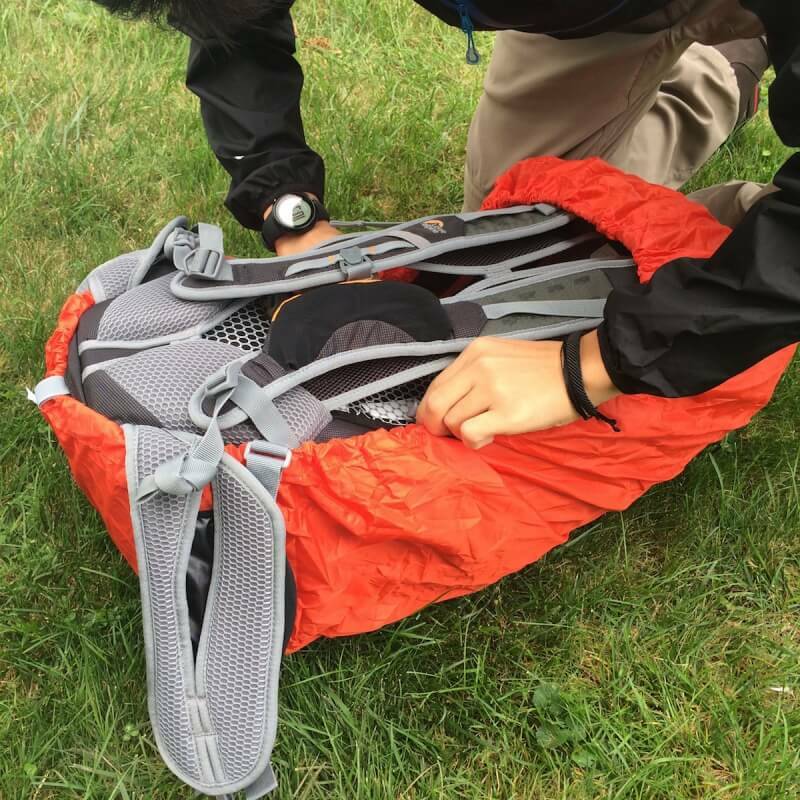 The Lowe Alpine backpack was provided for this review. As always, this Lowe Alpine review contains only my honest views and opinions. Some links found in this review are affiliate links, meaning that we get commission if you decide to make a purchase, at no additional cost to you. This helps to fund the site. 🙂 Find out more about me and this site here. This was a great review! I am going to purchase this bag and this review sold me. You included a lot of things that most reviews skip. (like the whistle)It would be nice if you included a little more on the inside of the pack and pockets, and can the waist straps be removed? Also the part about long straps helped because I am also very skinny at 5’11 and 135lb. Great job!